Congratulations to Dr. Kate Calvin, selected to serve on a National Research Council committee studying models for understanding complex adaptive systems. Calvin is a research economist working at the Pacific Northwest National Laboratory's Joint Global Change Research Institute (JGCRI) in College Park, Maryland. The study was commissioned by the National Geospatial-Intelligence Agency (NGA) to identify and evaluate modeling tools that could aid the intelligence community. Calvin has broad expertise in developing and applying computational modeling tools to inform decision-making about complex questions related to food security, water scarcity, energy use, and the impacts of climate change on vital resources. 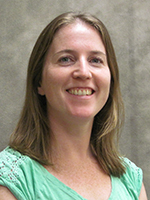 At JGCRI, she works with the Global Change Assessment Model (GCAM), an integrated assessment tool developed at PNNL with the support of the U.S. Department of Energy's Office of Science. GCAM enables researchers to explore the drivers, consequences, and responses to global change, taking into account all sectors of the economy and all regions of the world. The NGA, which provides imagery and geospatial information to support U.S. national security, is transitioning from a system that evaluates snapshots in time to modeling technologies that are essentially "what if" engines. Modeling will enable analysts to better understand spatial and temporal patterns; project future political, economic, and military threats to the United States; and evaluate options and consequences around the world. This study will investigate the types of models and methods that will help the NGA reach national security goals. The National Research Council is the operating arm of the National Academy of Sciences, helping improve government decision making and public policy, and increasing public understanding of science, engineering, technology and health. Calvin has a Ph.D. in Management Science & Engineering from Stanford University. Her research at PNNL's JGCRI since 2008 has focused on understanding the influence of bioenergy on land-use, exploring the interaction between climate and agricultural production, identifying the consequences of delaying climate change remediation, and developing scenarios of the future energy-economy-land-climate system.